Another Free Calls & Messages app that is now gaining its popularity next to Viber, KakaoTalk, WeChat is LINE. They are introducing their brand through TV Commercials like what WeChat is currently doing now. What makes this app differ from other same function app is that it has a lot of stickers. Line Stickers are more than emoticons that you can use to help you show what you really feels. 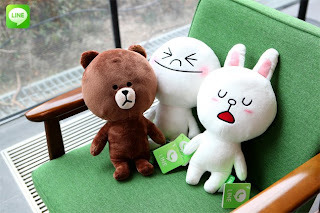 Their stickers are now available in the market in a form of a hug-able dolls, key chains and other type of toys.